1. Thehostel is open 24/. 2.Breakfastis included in the price of your stayit is servedbetween 8am and 10am on our 5th floor. 3.Terrace islocated on the 5th floor. You are very welcome to use the terrace forits view or as the only smoking place. Terrace is open from 7am till midnightonly. You enter the terrace on your own risk. 4.The hostelprovides kitchen and common areas which is open24 hours. No cooking between23.59 –10am. 5.The hostelprovides a fridge, which is at the guest’s disposal. Please remember to label yourfood (name and departure date) and please remove anyfood or drink that you may have left there on the last day of your stay. No labeledfood will be trashed. 6.The hostel provides a luggage room. This room is not under surveillance,therefore, in the event of any personal belongings being stolen, the hostelwill not be held responsible. 7.Guestsshall behave with respect towards other guests and hostel staff, and shall be heldresponsible for their own actions within the hostel, during their stay on our premisesor outside of the hostel, while doing activities organized by the hostelitself. The owner ofthe hostel and its directors shall be absolved of any responsibility in connectionwith the actions of its guests. Severe andrepeated harassment of other guests mayresult in the immediate termination of the accommodation contract, damageclaims and a permanent ban. 8.Bringingother visitors to our property isForbidden after8pm.Guest has toinform reception about every visitor who doesn’t stay in our hostel. 9.Beforeusing your bed or the room, please verify that bed/ room is clean and everythingis in order, otherwise it has to be communicated to the staff immediately to solveit. 10.Payattention to your volume, especially with open doors/ windows and during the nighttime from 10 pm to 7 am. The night-time quiet period is valid for the entire premises. 11.Home petsare welcome in private rooms if agreed prior your departure. Please ensurethat they remain quiet and that they are on a leash when going to and from the room. 12.Anypersons found drunk or under the influence of illegal substances will be deniedaccess into the room or hostel.Any personsfound drunk or under the influence of illegal substancesand causing troubles inside the hostel will be immediately asked to leave thehostel with no refund. 13.Smokingis not allowed in the rooms and in the common areas except someroom's balcony and5th floor terrace. Unfortunately, we must chargeyou € 100for Infringementsto cover the cost of additional cleaning and associated loss of sales. Should thefire department respond to the activation of a fire detector, we must also charge youthis considerable fee. 14.Toprevent fire, it is not allowed to prepare warm meals and drinks in the rooms -pleaseuse the kitchen in the 5th floor.It is notallowed to eat in the rooms, use 5th floor area please. 15.All roomshave lockers and, therefore, in the event of any personal belongings beingstolen, the hostel will not be held responsible. You can use your own lock orbuy one at ourreception. 16.If aguest wishes to leave before the end of their reservation, the sum charged for theremaining nights will not be refund. 17.You willneed to check out of thehostel until 11am. After 11am 50% of the new day reservationwill be charged. After 3pm whole price of day reservation will be charged. 18.Enjoyyour stay! Should anything fail to meet your expectations, please bring it to ourattention immediately, also regarding potential damages, so that these can be charged tothe person responsible and not to whole group or whole room population. 19.Anydamages caused during the stay must be paid to the hostel management before thedeparture. 20.Speakingof safety: Please make note of the escape routes in case of fire and the locationof the fire extinguisher. 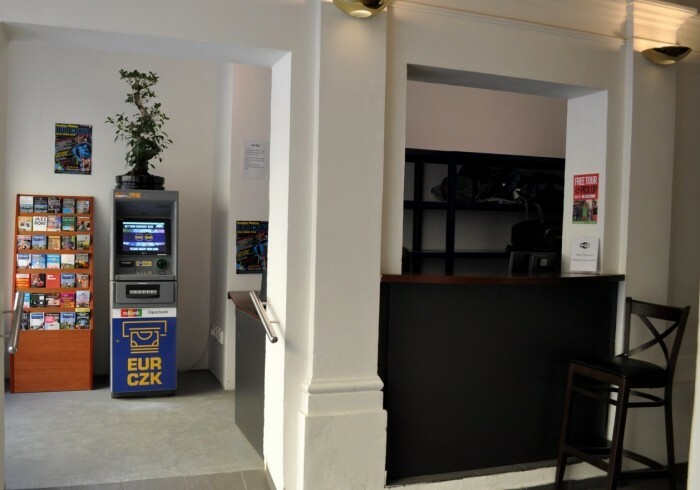 Cosmopole is the newest hostel in Prague City Center. Welcome. We are large, with a wide variety of room sizes (2,4,6,8,10,12 beds). Enjoy the restored old hardwood floors and gorgeous original wall and ceiling moldings. Cosmopole is spread over our six floor building (with elevator, of course! ), and all is spacious, with wide hallways and grand new bathrooms on all floors ... and best of all, we turned over the entire top floor to common activities – no beds, just big rooms and outdoor terrace for all to meet, relax, play games, have breakfast in the morning or a drink in the evening, and enjoy. All our receptionists speak a minimum of 3 languages. They are trained to help you make this travel destination your best ever. We are sure you will feel at home with us. We are centrally located just a few steps from all the riverside and major attractions, shops, bars, clubs and restaurants) in the most beautiful ancient city in the heart of Europe. Very close to train and bus stations as well as to the airport (see the directions). We provide free guided tours, free WiFi, free tea & coffee and other touches you will love. Our hostel has fantastic self-catering facilities where guests are welcome to bring their own food to prepare meals. Our kitchen includes a big fridge, a microwave, a few cooking plates, an oven, all the appliances you need for cooking and plenty of pots, pans, crockery and cutlery.